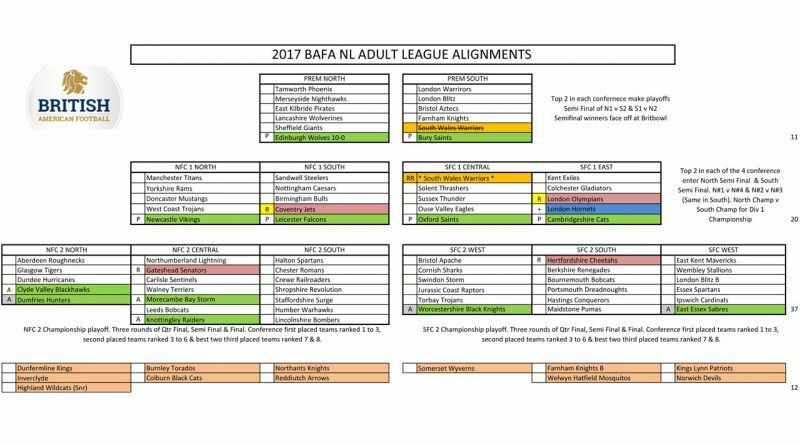 BAFA Announces New 2017 League Alignments! Please find attached the Adult league divisional alignments for 2017 Season. Over the past year we have had interest from up to 18 new associate teams, that are all at various levels of league applications. Some teams have opted to delay their league entry for one more year in associate process whilst others are much earlier in the overall process. And as these teams progress, BAFA NL are very pleased to formally announce that Richard Colin has agreed to join the NL management team and will oversee the associate process for BAFA. Richard helped develop a very successful assessment process for National leagues, and allowed us to re-visit our minimum standards, that we are confident will develop new teams to have a very strong foundation as they enter the adult league in future years. With this in mind, we would like to welcome six new teams in BAFA NL play for the 2017 season. All six teams will enter the league at Division Two Level. The biggest news will be the second straight year the National Leagues are expanding the Division One conference from 18 teams last year to 20 teams in 2017. The overall performance of a number of Division 2 teams has demonstrated to NL management, that these teams are ready to step up to the next level. This 20 team structure will allow the structure to return to four conferences with 5 teams each. Instead of the 3 conferences last season. 10 teams North & 10 teams South, we still plan for a 10 game schedule, and the playoffs will be regional also until the North Champion faces the South champion, for the Div 1 crown. With the inclusion of the NFC2 & SFC2 finalist (Leicester Falcons, Newcastle Vikings, Oxford Saints & Cambridgeshire Cats) we are also pleased to welcome the London Hornets into Division 1. The Hornets won their SFC2 West conference with a 10-0 season, and narrowly lost to the Cats by a score of 9-0 in the playoffs. Rounding out the last spot in Division One for the will be a surprise to a number of you, and that is the inclusion of South Wales Warriors. After what could appear to be a successful 3-6-1 Premier South season, the South Wales contacted BAFA NL about the overall doubt for the future of their team. Due to injuries and retirements, SWW are left with a smaller squad than normal, and do not feel they can compete within the tough Premier league structure. Following discussions with Director of Competitions, Russ Hewitt, the Warriors committee were provided three possible options for the 2017 season. This option means a team in trouble can’t drop down to just have a playoff run and possible bowl win. Option Two = Stay in current position and play out season. We understand these three options are new to NL, but we do feel it’s a fair option for a team that is honestly struggling at the level they are currently at. We can confirm South Wales Warriors selected Option One, and they believe this is the best option to rebuild their football programme. For the 2017 season, they will compete within the SFC1 Central division, but irrespective of final record, will not be eligible for any post season football. We can confirm that BAFA NL have taken time to check the overall status of other Division one teams, but do not feel any other teams is ready for promotion to Premier just yet (based on 2016 records). So now BAFA NL will discuss the possible options with the remaining Premier South teams to ensure a balanced Provisional schedule. We will confirm back once these discussions have taken place with each team. To round out the BAFA NL League structure Division Two will remain as three Conferences in both the North and South. We have worked to keep each conferences as regional as possible, with the first All Scottish conference for quite some time. Double Coverage will be sharing more information and analysis on the league structures over the following hours and days!